San Miguel Creek Ranch has been a family owned and operated ranch for almost 50 years. We are a working cattle ranch and are now specializing in offering trophy whitetail deer, Russian boar, javelina, turkey, quail and dove hunting. The ranch is a managed wildlife area under high fence, which maintains food plots and protein feeding stations. The wildlife is native to our ranch and through years of game and range management we consistently produce record whitetail bucks. All hunts on our ranch are guided. 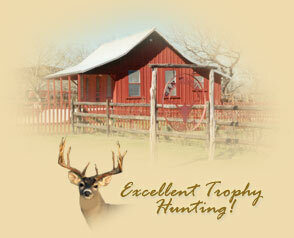 We provide modern double blinds, automatic feeders and a walk-in cooler and freezer for game storage.